Wotofo is at it again, bringing mesh to the masses with the Profile Unity RTA. Once again designed by the Profile RDA guru MrJustRight1 and adding Brian Herb fromThe Vapor Chronicles, designer of the Drop RDA, Dovpo Topside and other cool gear. If you are not already familiar with the Profile RDA which was released sometime back in September 2018 it was the first Mesh RDA that I not only loved at the time but still use to this day. It became one of the popular RDA’s back then, I know a local vape shop that was selling them like crazy. What they finally got right was a spring mechanism that kept the cotton in constant contact with the mesh, something that plagued earlier Mesh rebuildable tanks. I personally tried about 2 or 3 mesh RDA and RTA’s and you could get them to work but overall they were a PITA and not worth the trouble. 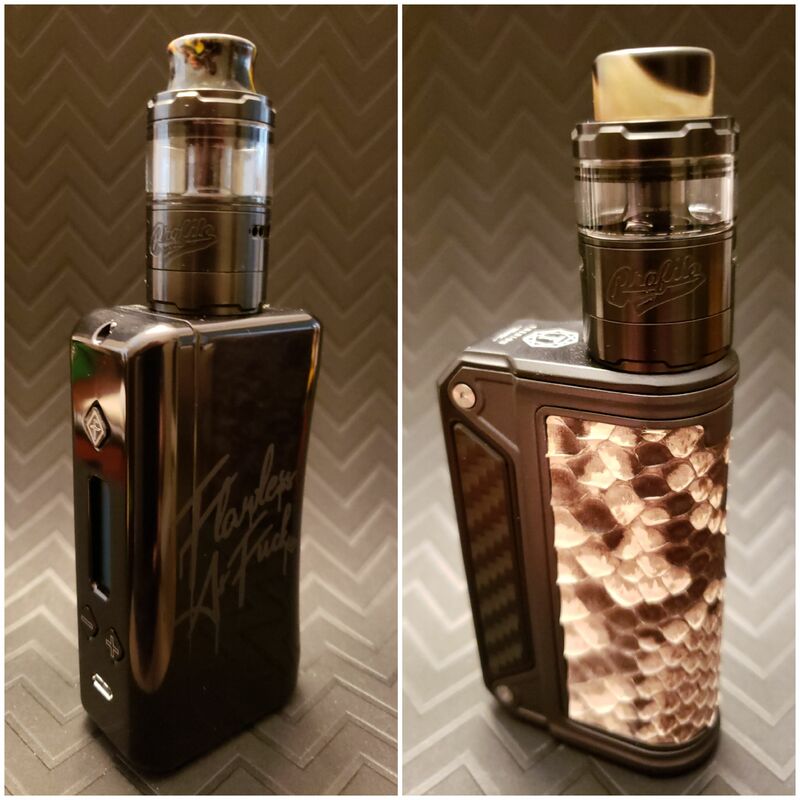 Mesh can work great though, look at how it has nearly dominated the sub-ohm tank market, nearly every new prebuilt coil coming out now has a mesh coil option. 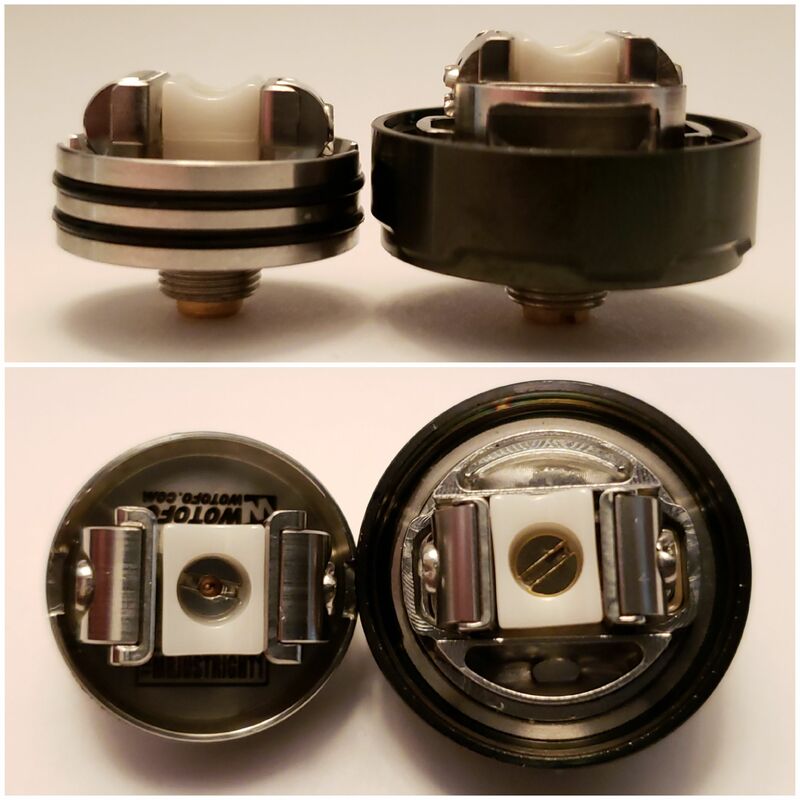 The Profile Unity RTA has a similar build deck to the RDA, here is the Profile RDA deck on the left, RTA on the right. The white grooved thing you see in the middle is spring loaded, it is there to keep your cotton snug against the mesh once installed, simple idea that works. The fit and finish of the tank is pretty nice and threading is smooth, no struggling to find the grooves. Half a turn and the top cap comes off to fill, would have liked bigger fill ports though. Airflow with all 5 holes open is pretty airy, airier than I was expecting so closed it off to 3 air holes open on each side which came me a little restriction and a bit of a flavor boost. Smooth and quiet airflow, tried all the openings and not noisy at all. 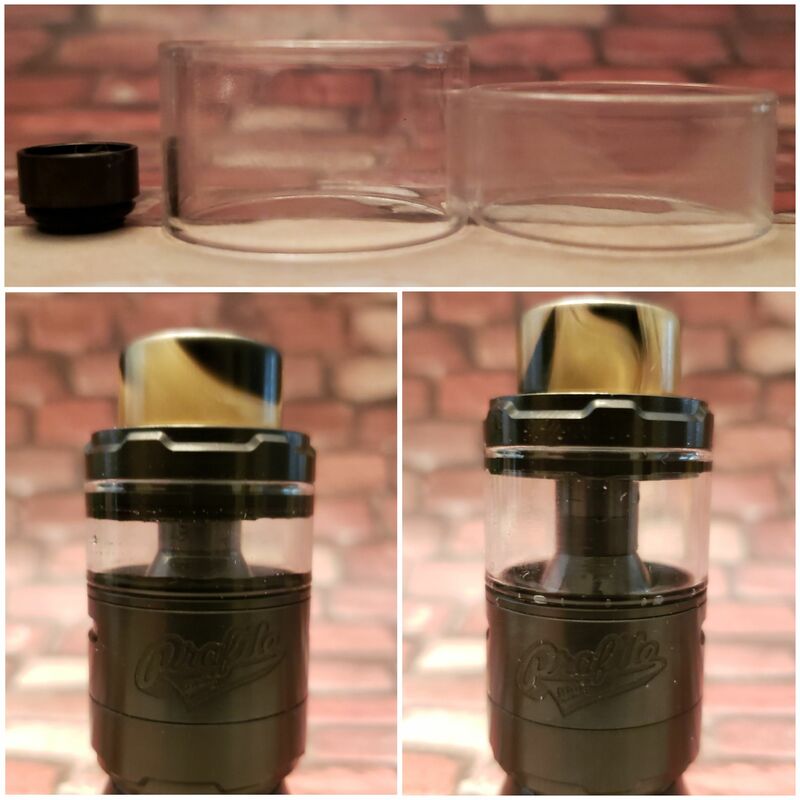 When I used the included drip tip (no extra drip tip included which is a con) I had to open up another air hole as the included 810 drip tip has a narrow opening. Here is a pic of a normal friction fit 810 on the left, Wotofo Profile included 810 center and friction fit 510 DT on the right. As you can see the Wotofo provided DT has the smallest opening, smaller than a friction fit 510. Since I prefer more airflow I swapped it out after the first tankful and got a bump in flavor. 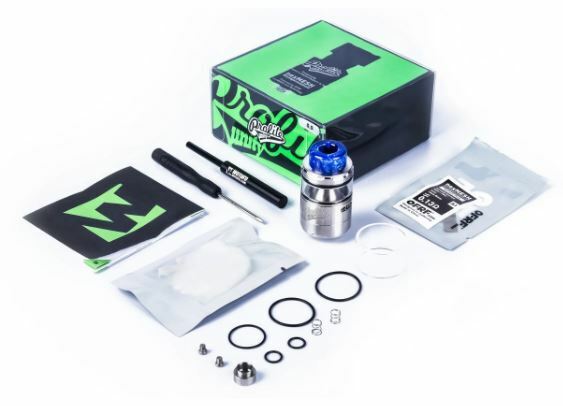 Wotofo does provide extra o’rings, spare springs, screws and the normal whatnots including a chimney extension with taller glass for it to make it a 5ml instead of 3.5ml. You also get (2) OFRF nexMESH and (2) 6mm Agleted Cotton for wicking. No spare 3.5 or 5ml glass are included so if you break one you need to go with the other. 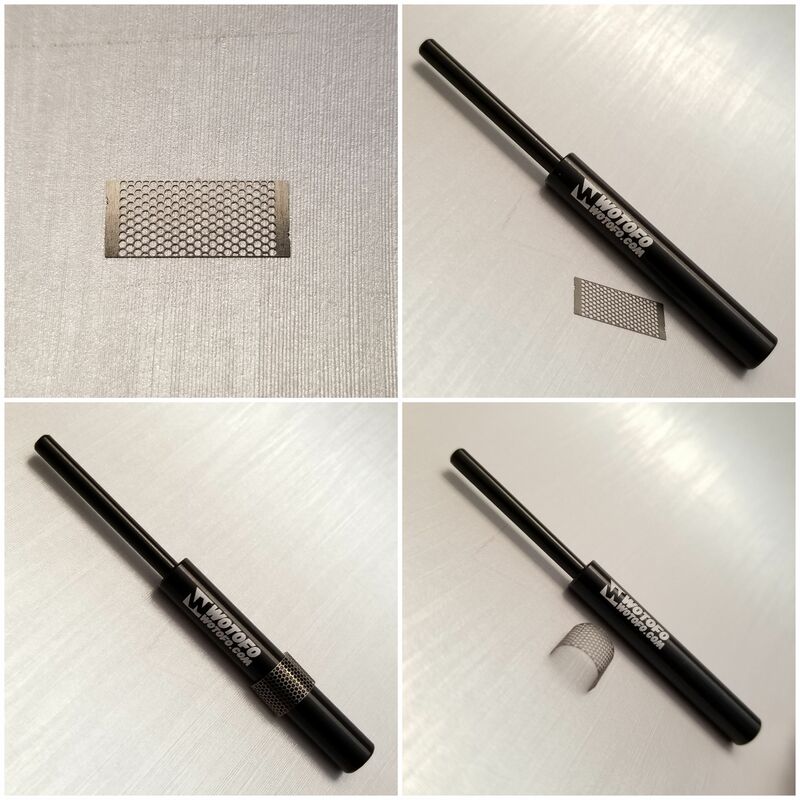 Installing the mesh is about as easy as it gets, just use the supplied tool to bend the mesh in advance and install it. 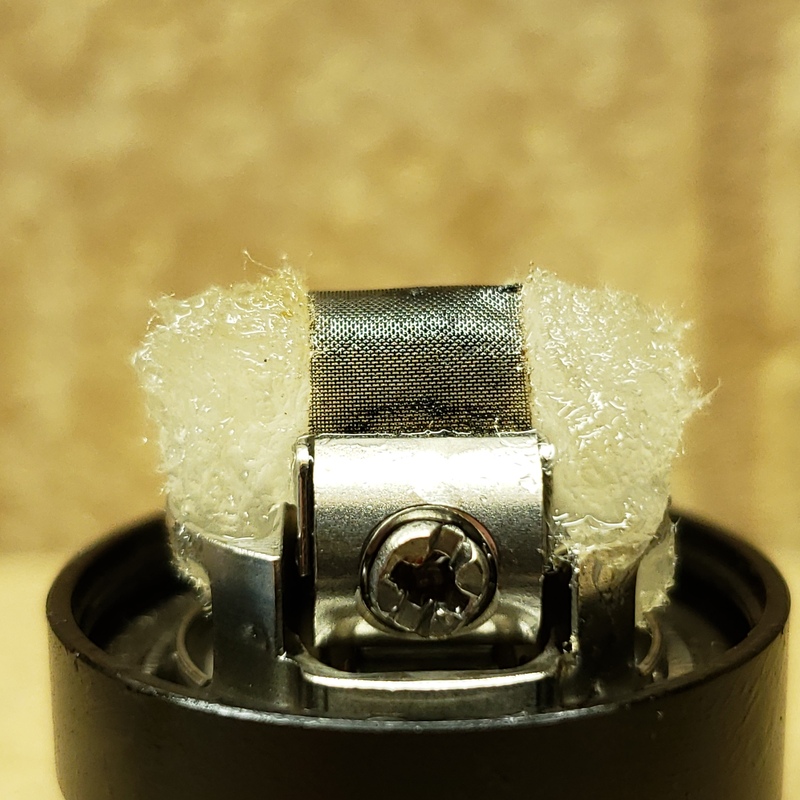 Not going to bother showing the rest of that build, it was good but I found using the included Agleted Cotton it was just too thick and wicking suffered, could vape fine at about 45 watts but anything about that gave me the dreaded mesh dry hits…cough cough cough. When I removed the build the cotton under the mesh was like a rock, too much wick. Here is a pic of the included Wotofo Agleted Cotton next to the Cotton Bacon Prime wick I used next. This build here was my favorite using Vandy Vape SS316L 200 Mesh and the Cotton Bacon Prime wick I show above, just use one of the included mesh as a guide to cut to the same size. Wotofo includes a guide on wicking in the owners manual, a nice touch as it is tricky. When feeding your cotton you want restriction, enough that it is not easy to pull out but not so much that it is tough to get through. Once in cut the cotton at an angle on both sides and uses a pointy tweezer to get it nice and fluffy. Additional trimming might be necessary as you do not want your wicks to reach the bottom, just peaking into the wicking slots and enough to block any juice from getting into the deck. 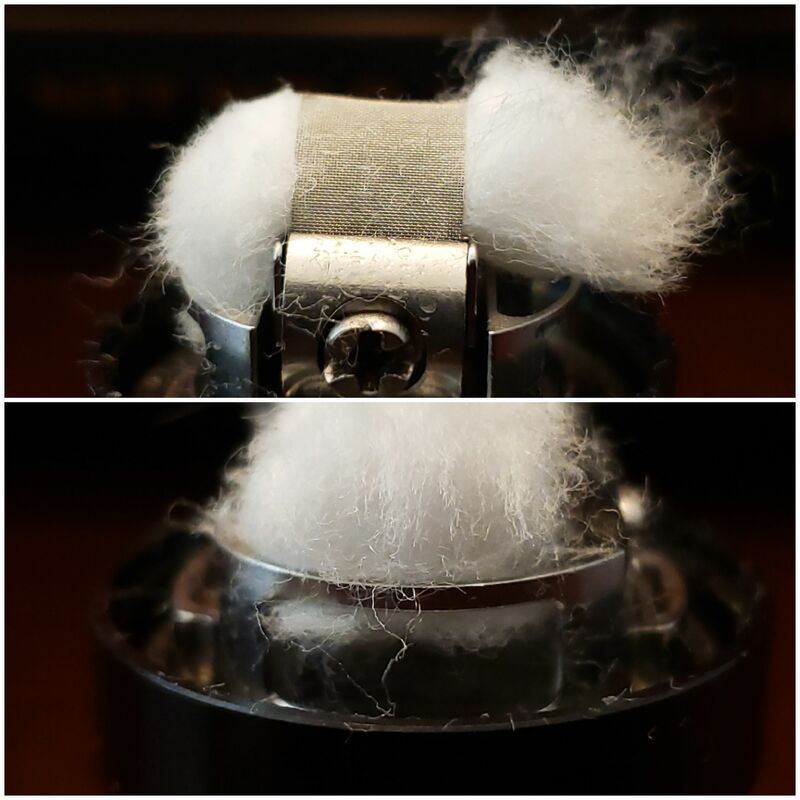 Once your wicks are in place you can trim the top of the cotton near the mesh, just be careful not to cut the mesh. In the pic below the tucked wick on the left has had the wicks trimmed near the top, the other side still needs a little trim once the wick is tucked in. Care needs to be taken when installing the deck and the deck cannot be installed when on a mod or a build station as it only screws in from the bottom. There are slots in the chimney that line up with the base, best to try and get the slots close and not just spinning it around until it falls in, you can mess up your wicks. That build above lasted me a good 5 days and about 10 to 12 fill ups before I decided to take out the deck to see how the mesh was holding up. Look at how nice and juicy that is, performing like a champ and no problems chain vaping at 75 watts…what dry hits, not this guy. Wasn’t even gonna bother rebuilding it, still looked great and more importantly performing great after 50+ mls of juice…Then it happened, was all cocky thinking yep, I rock and was putting the deck back in and spinning it around until the slots lined up, screwed down the deck and filled it up…oh noooooooo, leak city, lost a good ml or more of juice. Turns out the wick got snagged as I was spinning it to line up the grooves and yep, had to re-wick…bummer. If you do use the included Wotofo Agleted Cotton might be wise to thin it out first. 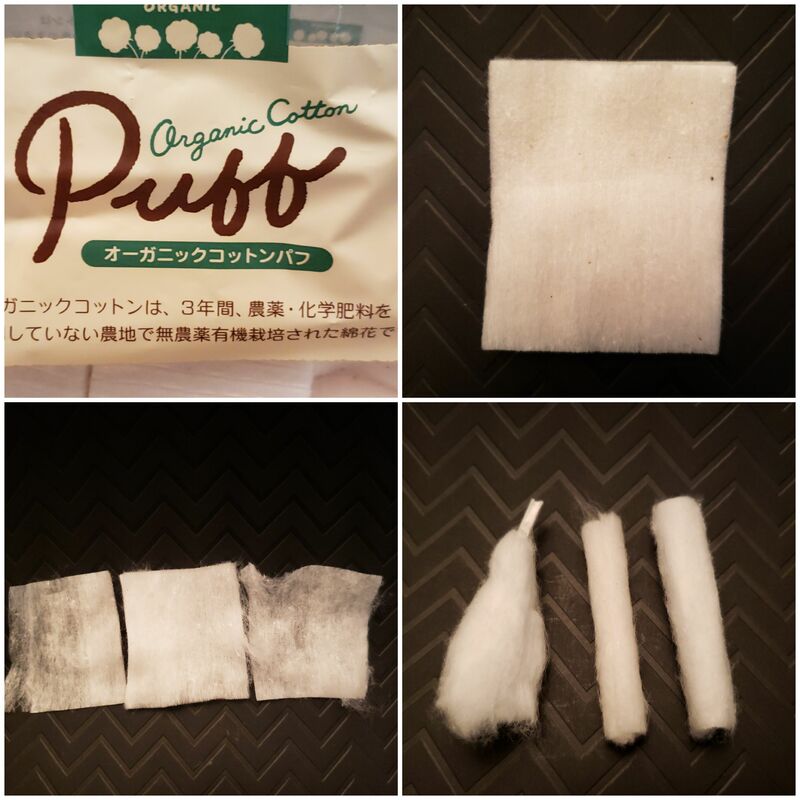 I had success using Native Wicks Platinum Blend and even Puff Organic cotton, you know, the cotton pads. 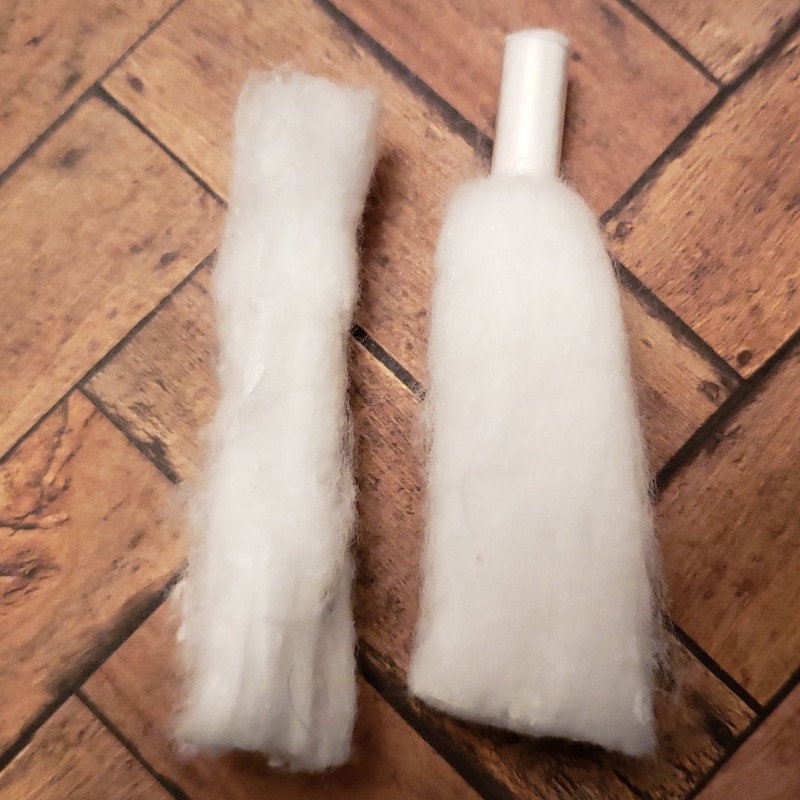 If using cotton pads cut it in half, remove 1 of the top layers and stretch it out like the Scottish Roll method (google it if you don’t know) your half of cotton should look like the cotton on the right after stretching. You can use the whole pad if you want but you then have to remove both top layers from either side. 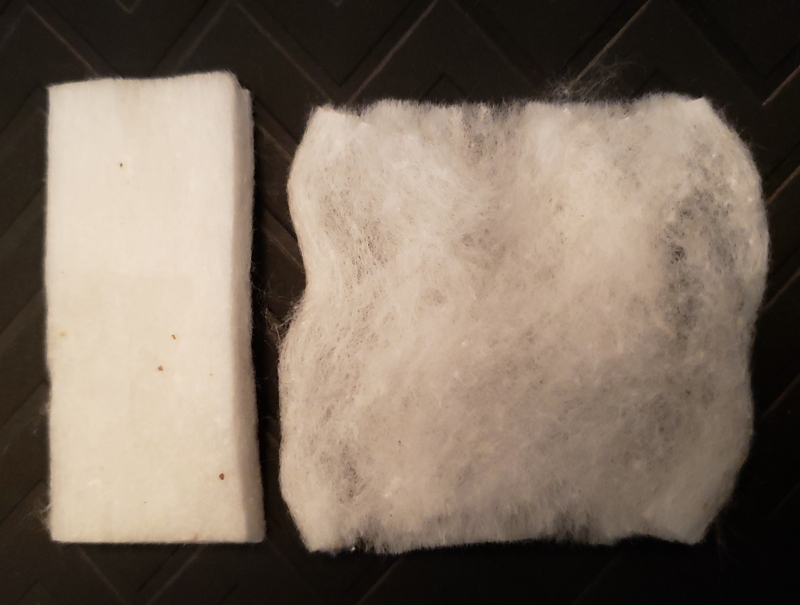 The bottom right pic shows the Puff Cotton in the center, Wotofo cotton left and Cotton Bacon Prime right. I got the same performance from both so might as well get 2 wicks instead of 1. 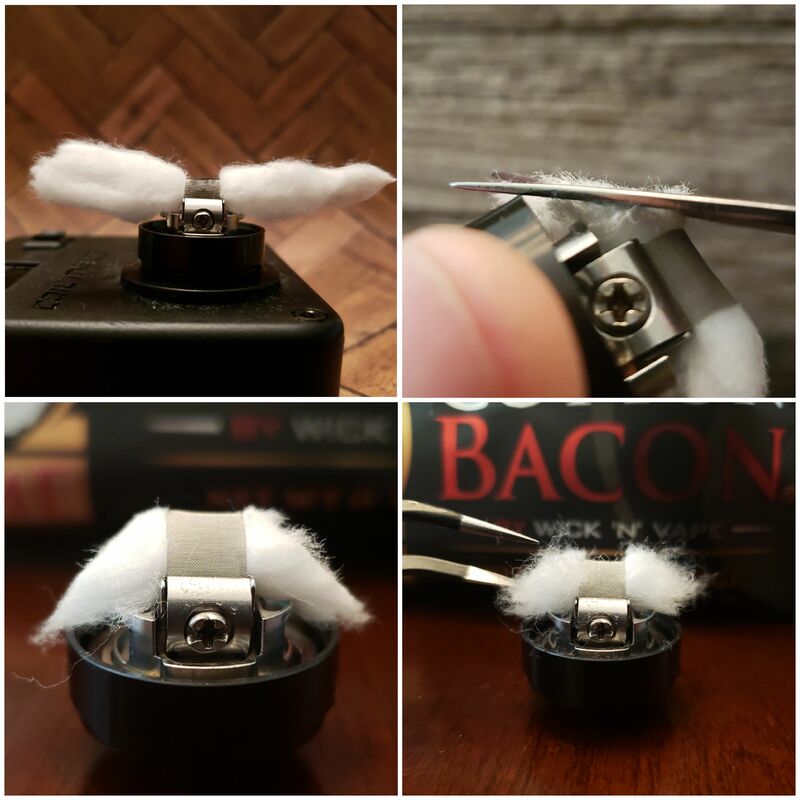 My preferred wick is still the Cotton Bacon Prime, was able to get the highest wattage before dry hits but the other works fine up until about 65 to 70 watts. Any loss of flavor with the chimney extension and how does it perform? I ran it for a few days with the short glass at 3.5ml and it was flavorful but a bit spity. With the same build, I replaced it with the chimney extension and 5ml glass, thus making it taller. Now I am not the biggest fan of chimney extensions, the further the coil is away from your mouth the more possibility of flavor loss, that is why bubble glass is so popular, more capacity but the same distance to the coil. Using the same juice the first thing I noticed with the extension in place is a big reduction in how spity it was. Not like your drinking your juice spity but more of a moist vape, the extension made it drier. I do find a moist vape to be more flavorful and that was the case here but with the extension, I found I didn’t mind the slight flavor loss for and a decrease in spit back. Still found it to be a flavorful tank without having to smack your lips so much from the sugar lips. Really doesn’t add too much height, maybe about 2mm taller or so. Now compared to a normal RTA using normal coils it is different just like the Profile RDA is different from a traditional RDA. If you don’t like the Profile RDA then you probably won’t like the Profile RTA, if you love the RDA then yeah, the RTA is probably already in your hands. The wicking is more tricky with the Profile RTA over the RDA though, I do wish they would have added a squonk option to the RTA just like the RDA, push juice from under the cotton would have been great. With the juice having to feed into a thick wick from the sides rather than the bottom makes wicking that much more critical. I won’t be giving up any of my favorite normal coil RTA’s anytime soon and replacing them with a squadron of Profile RTA’s. I do feel they both have their place in my rotation though. I have been enjoying my Profile RTA on my single 21700 mods, usually with the Vandy Vape SS316L 200 mesh in TC. Doesn’t take a lot of power to spark up the mesh which means I can go for a while on a single 21700. Of course, I could also go all day with a larger mod. It is more of a tame vape then my usual dual coil RTA’s but the flavor is good and once you get the hang of it quick to build and wick. The downside is how much wick you have to use but the build should last for a while unless you do like me and get all cocky when re-installing the deck. Do you love the Profile RDA? If so then get this, just don’t expect it to be as easy to wick. Did you think the Profile RDA was an overhyped POS? Then skip the Profile Unity RTA, I doubt it will change your mind. 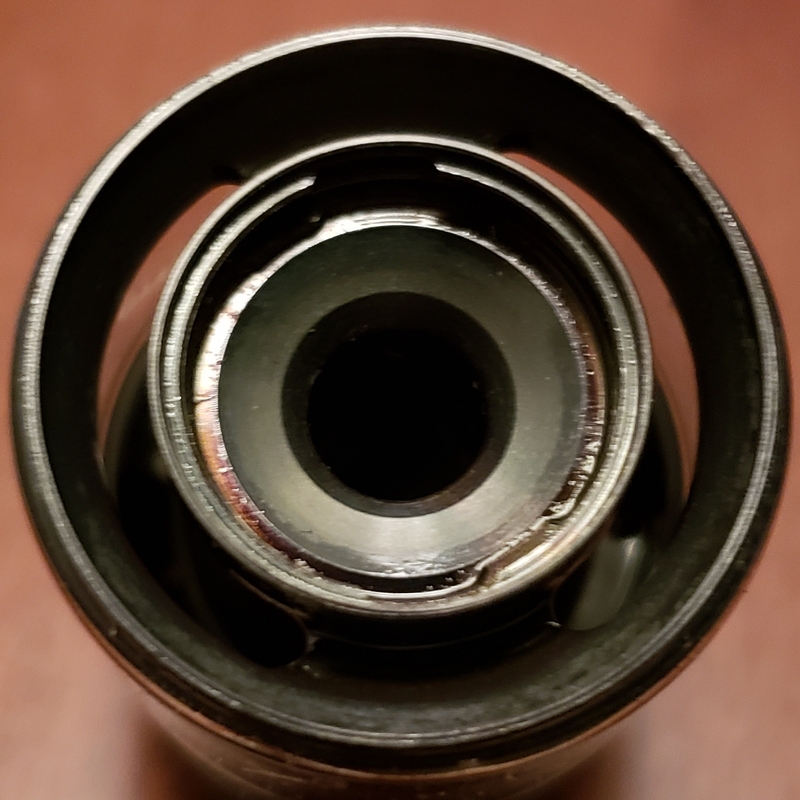 The vape you get from a mesh rebuildable is different enough that I can completely understand why some will discard it and stick with there normal RDA and RTA’s. Some say it is dry and yeah, it can be. It definitely is not as rowdy as an RDA/RTA with a pair of lava spitting Aliens in it, it is not supposed to be. It is not for high powered vapers, at best it can go up to 80 watts with a great wick job but is more comfortable in the 50 to 70 watt range. I do enjoy the Profile Untiy RTA but not as much as the Profile RDA, the RDA just has me hooked. As I was gathering my thought to write my final thoughts it dawned on me that I have had the Profile RDA for close to 8 months now and still use it at least 4 times a week on a squonk mod, it has never left my rotation. I then began to think if the new Profile Unity RTA will also get the same amount if use and my first thought is no. I will use it from time to time, primarily on my single 21700 mods as overall they match up well but I have a number of single coil RTA’s which I enjoy just as much on my single battery mods and some even more. I’m sold! I’m currently vaping on my Profile RDA, and I do love it, so I guess I need to pick up the RTA as well! I love mesh! @SunnyT yeah, I bet you like it. Really like to hear your thoughts if you pick one up. I’m glad to see some reviews coming in. Yours enlightened me a few ways. The deck, I had assumed would be just like the RDA version, which I have. But bottom installation sounds similar to the old Boreas-getting the tabs lined up. Could be a little fiddly but that’s OK.
And I’m surprised it didn’t come with any squonk pins. 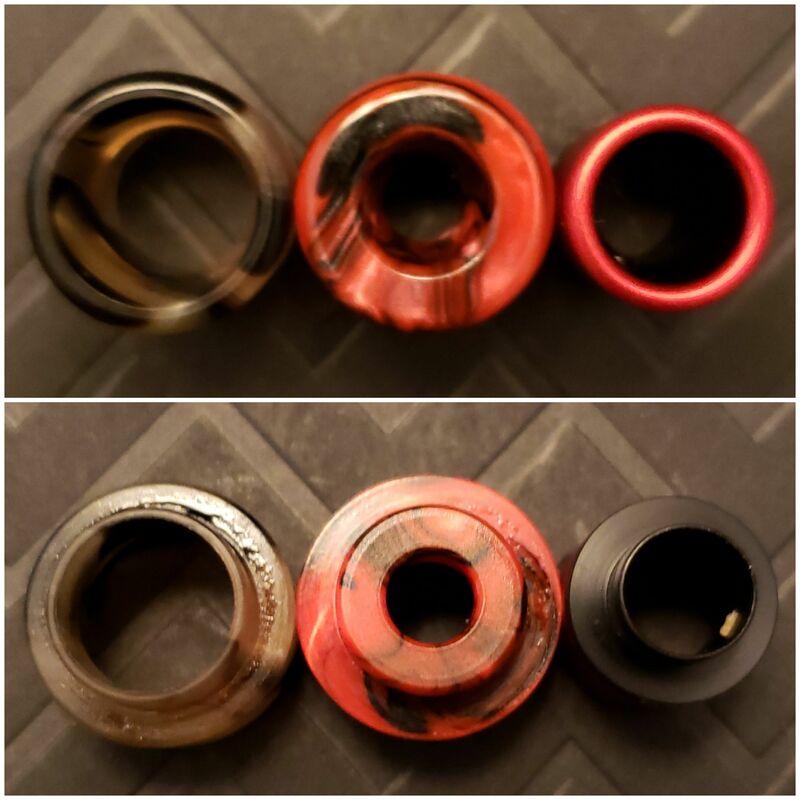 Have you by chance tried the RDA pins to see if they are interchangeable? Thanks bud. Not much time nowadays for me to get out reviews but usually slow down a bit in Summer so will see what happens. If you look before you install the deck it is easy, I just got too over confident with that build and it cost me…haha. Have you by chance tried the RDA pins to see if they are interchangeable? I had not even thought about that, will give it a try but will probably have to change the screw that keep the white spring thing in place. I do have 2 profile RDA’S, first one from review and second I bought. That would be great if it works, will report back tonight or by the weekend. Just tell me you like it after you get it. Lol. Thanks mjag, gave me something to reconsider. As always it would be great to hear what you think of it if you do get one. 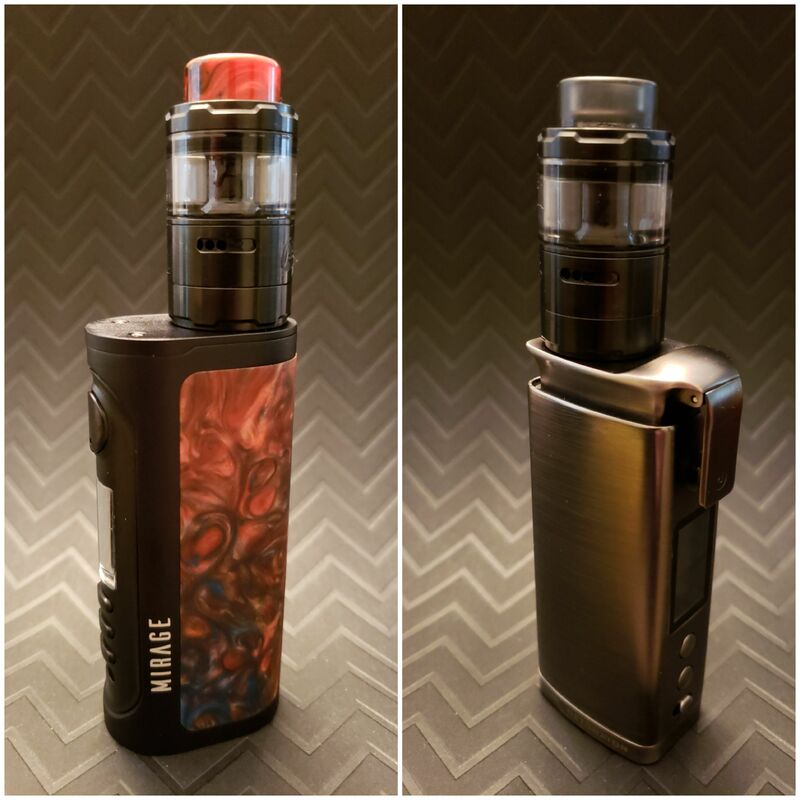 On a side note did you ever get a chance to try the juggernaut mini clone and how does it compare to the OG? The jk mini clone is a pleasant treat. The only differences are minor enough you have to actively be looking for them, vape is the same. Very happy with it and may order a couple more for the closet. As far as the Unity rta, will probably wait for a holiday sale, pretty happy with the wire I already use. Great review, I agree with you as I feel much the same as you do about the Profile’s details.